Formerly known as the Devil King Satan, Sadao Maou is really in for it now that he’s been transported to another world. 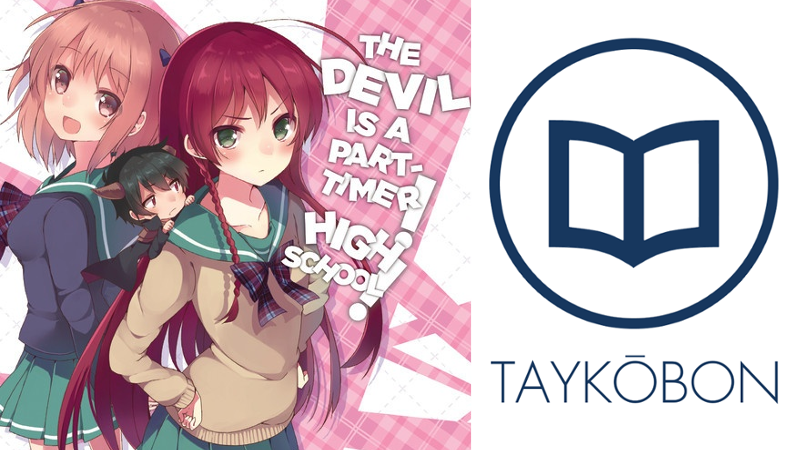 While fending off the hero Emilia and the advances of his classmate Chiyo, Maou must quickly figure out how to reach the top in this strange place called “high school” in this spin-off of the hit light novel series The Devil is a Part-Timer!. Transfer student Sadao Maou is a regular high-schooler who has your typical problems - girls who like him, teachers out to get him and classes to attend. This ignores that in another realm, he was the fearsome Devil King Satan but after being exiled to Earth he is content to work his way up the social hierarchy at school to complete his grand return to power. However, his class receives another transfer student in the hero Emilia, who was responsible for Maou’s defeat and has sworn to finish him off! This series is quite accessible and requires no background knowledge of the series. Fans of school comedies will find plenty to like here. The Devil is a Part-Timer! High School! delivers plenty of laughs and was an extremely entertaining spin-off because of how well it makes use of its high school setting. The main focus is on the continuing struggle between Maou and Emi, as Maou has grand delusions of taking over the high school being a stepping stone to conquering the world. As such, Emi finds herself obsessed with stopping him, leading to a number of awkward and hilarious confrontations as they are forced to coexist in the same classroom. Added in to the mix is their classmate Chiho Sasaki who has a crush on Maou and worries that Emi is trying to steal him, and Maou’s guardian Ashiya who works as the school’s janitor. Overall, author Kurone Mishima did a great job adapting these characters into a high school setting, and notably it never really feels like these characters are artificially shoe-horned into the setting thanks to their well-utilized positions within the school. The characters always felt true to the source-material while different enough to make this a worthy and well-done spin-off. I really appreciated how quickly this volume was able to provide characterization to all of its characters without getting bogged down in backstory. It established within the first few pages exactly who all they are were and this was greatly appreciated for allowing the story to keep the focus predominantly on the comedy. And deliver it did, as the snappy banter between the characters throughout the various typical high school events was a lot of fun, adding a spin and always keeping the proceeding light-hearted. As soon as Emi was introduced, her and Maou began to bicker hilariously and this was a dynamic that never got old or annoying as it continued throughout the volume. Additionally, the class’ school trip was another highlight for providing plenty of laughs as well as some good characterization. I liked that Chiho plays a much bigger role in this series in aggressively going after Maou, and her confronting Emi about this was both funny and believable considering the high-school setting. Finally, it’s important to note that if you’re looking for an larger over-arching plotline you may want to look elsewhere (such as the main series!) as this volume functions more as a series of hilarious episodes than a cohesive story. This didn’t bother me considering how confident the series is with proceeding in this direction, and I liked that it avoided trying to do too much by do both the comedy and story half-way. Mishima’s artwork is a highlight of this volume and brought this series’ characters to life beautifully. It was great to see these characters rendered so well in manga form, and I really liked how effectively they were all fit into “high-school” roles, which sold the setting effectively. Additionally, character expressions were done expressively and this helped to accentuate comedic bits, making them even funnier than they would have been otherwise. It bears noting that although this volume features oversized pages, this is still a pretty slim release coming in at about 110 pages. This doesn’t affect the quality of the story at all but considering that this volume is full-priced, it’s definitely an expensive proposition. The Devil is a Part-Timer! High School! is a well-paced and entertaining spin-off delivering plenty of laughs thanks to its snappy banter and great adaption of these characters to a high-school setting. It utilizes many of the tropes of this setting effectively, with the interesting character dynamics spicing things up well. While it doesn’t do too much plot-wise, I found these snapshots of Maou and Emi’s new high-school life to be very entertaining while true to their original characters, making for a fun ride that both newcomers and fans of the series will enjoy. The Devil is a Part-Timer! High School! Vol. 1 was published by Yen Press on August 18th, 2015 and covers chapters 1-7 of the series. Authored by Kurone Mishima and based on the original story created by Satoshi Wagahara, the series is currently ongoing in ASCII Media Works Dengeki Maoh magazine. Volume 2 is scheduled to be released in English on November 17th, 2015. For more reviews, keep an eye on Taykobon, your home for reviews of manga and light novels. You can also follow us on twitter @taykobon for more updates! If you’ve read this work or have any questions or comments, we would love the hear from you in the comments below!